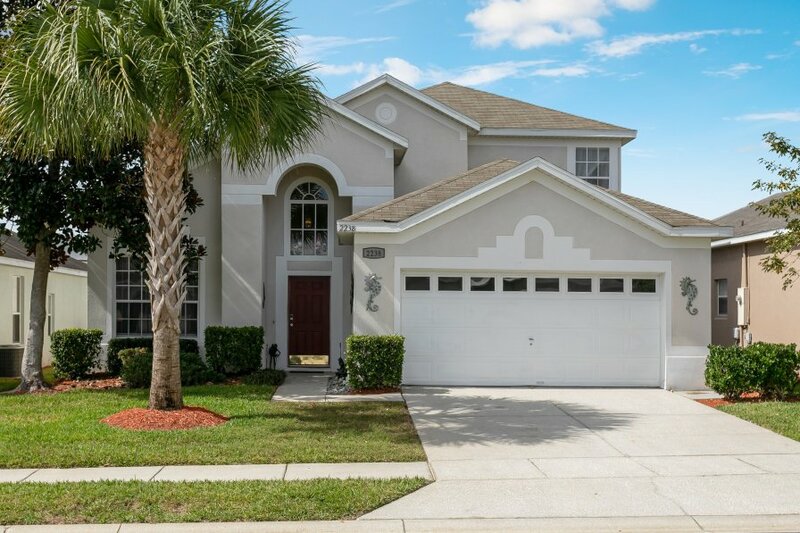 This stylish 6 bedroom, 4 bath home, just 4 miles from Disney, offers all the comforts of home and resort amenities. This vacation home is located in the popular 24 hour Security guard Gated Windsor Palms Resort community. There are three bedrooms on the first floor (queen bed, another queen bed with an en suite bathroom and a king bed with an en suite bathroom) a living area with sofas and a flat screen TV. Upstairs, you will find three more bedrooms (one king bed, and two rooms with 2 twin size beds in each room). All bedrooms have TV's and there is free Wifi, cable, and AC throughout the house. Additionally Bed linens, towels, and your basic toiletries are all provided as well as a fully equipped kitchen to cook meals for your large party. There's an oversize pool and large deck with spa and ample pool furniture. The garage is set up as a games room with a pool table, dart board, TV and air hockey. The clubhouse has a cinema, exercise room, Wii room, sundry, and a games area. Outside there is a large communal pool, tennis courts, basketball and volleyball and a BBQ picnic area and kiddies play area as well as a tiki bar that serves drinks as and some food. Our house is located just of the 192, where there is a large selection of restaurants, takeaways and shops, including large super markets (Walmart is just down the road) for all your needs. We are available anytime for any questions and any assistance. We are not run by a big management company where you are just a number. We are the owners of the house and we live locally. We take care of the house as our own and you will experience the difference!